First, be advised that all of these VCD's are IN CHINESE ONLY . In our opinion that doesn't matter much because the instruction is clear and the quality of photography very good. But we will not accept returns just because people didn't read... IN CHINESE ONLY . Given that, these are really tremendous deals for the money. Each of these special VCD's can be played on a computer for full enjoyment. Made for PC's they are also Mac compatible by downloading Quick time (for free) and any similar VCD player program. Also playable on most DVD players. For less than $10.00? Wow! There are over 100 styles of BaGua currently, not to mention hybrids such as BaGua/Tai Chi. Here are a few of these which may hold interest. One is a survey of the Sun style including BaGua and Xing Yi with the daughter of world-famous teacher, Sun Lu-Tang. 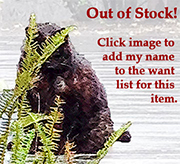 Click on pictures to see larger versions. Click to see a video on Tian Bagua style. A surprisingly strong performance of a mixed set of Bagua by a national champion. This medium sized set is a solid compilation of many aspects of Bagua besides the Palm Changes. It also blends the Bagua Animals as well as some Old Palms positions. Additionally, kicking methods are shown within the form and capturing the flavor of the style. A good performance set for about intermediate level and one that is clean enough that whichever style you might practice this can be applied. Though often less than 100 pages, these 'en face' books offer both simplified Chinese and English face to face. In addition, they include a VCD with the form in question demonstrated, often by top performers. The narration in both the Chinese and English is minimal, leaving it pretty much up to you to figure out how to move, but the photographs are quite clear and the English helpful. If you are interested in the form, it is a good value. 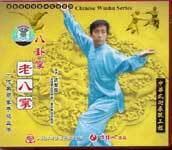 This is a double disk set devoted in the main to a wide representation of Bagua in China. Strictly a demonstration series this one shows literally dozen of practitioners performing what seems an infinite series of variations on the eight changing palms. Among the more famous players are Sha Guo Zheng, Ge Chun Yan and Lin Qiu Ping. The second disk shows instructors demonstrating Bagua walking , sword and saber. A really good survey for the money though it doesn’t truly differentiate between contemporary WuShu and traditional Bagua. A Double Disk. Wu Shi Jun is a popular teacher who, at one point, became the student of the famous Li Zi Ming. This is a set of short but very "twisty" Bagua changes. Not quite as simple as most "Old Eight Palms" these are somewhere between full one changes one is used to and the single action change most often associated with the mother palms. Wu is very flexible and light in his movements. There is not much application spoken here but the introductory section has a number of stance and twist training methods. A very pleasant rendition. 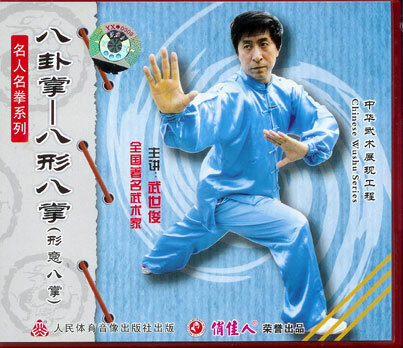 Jiang style "New" BaGua is also represented by Luo Jin Hua. This is an interesting version that seems to combine the idea of the basic Eight Palms based on the animals into changing palm like transitions. Another way to put it is that this form has eight shapes based on the following animals: Swallow, Hawk, Bear, Monkey, Dragon, Snake, Tiger and Horse. Each of these palms is usually associated with a single, simple change but in this set each palm has a change pattern of about eight movements. A very interesting thought not primary set that combines some of the energies of Bagua with some of the directness of Xing Yi. To our knowledge not associated with a particular style. Wu Shi Jun is a professional and polished teacher. This is the first representative VCD we have had of the style created by that famous martial artist Fu Zhen Song. Demonstrator Shou Kun is an agile and obviously practiced player. His movements are light and flexible as he demonstrates the 8 Changing Palms. Toward the end there is also a demonstrations with applications of some of the postures - short but instructive. Fu Zhen Song creator of FU style BaGua. This is our third version of Jiang Rong Jiao's BaGua we sell (Ted Mancuso's and Kang Ge Wu's version being the other two). The teacher here is the well known student of Sha Guo Zheng, Luo Jin Hua. Luo's movements are worth watching. A little tight (in the sense of smallness) than most his BaGua also has some nice elaboration. A very clear presentation of his movements. A strong, straight forward presentation. Luo has an active style and an alert mind. Click here to see his lineage. See DVD version of this disk. This is very nice "linked palm" set with tight changes and the so called "Swimming Dragon" flavor. Luo Jin Hua's movements are clear and precise with a relaxed but dynamic style. This set almost comes under the heading of "cascading palms" and is a nice combination of movements where palm changes and postures intermix . Click here to see his lineage. BaGua Pian Shuan Dao with Hong Yin Xiang. This is a longish, involved set performed with the large BaGua saber. Well constructed set representative of the GAO branch of BaGua developed by Gao Ji Wu. Teacher Hong here shows the breakdown with the aid of a student. What is distinctive about this sat is the use of the left hand to momentarily treat the saber in a double handed fashion at points in the form. See more of this style. SUN JIAN-YUN, the daughter of the very famous martial artist and writer, Sun Lu-Tang leads this demonstration tape of the Sun Style. Though the cover lists Sun T'ai Chi there is more here than that. 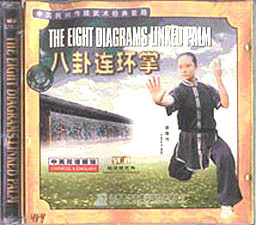 This is not an instruction VCD but starts with a performance of Sun T'ai Chi by Sun Jian-Yun, herself an "old Shihfu". Other students and family members help demonstrate T'ai Chi, Sun Style Ba Gua Partner Sword practice, Sun Style Hsing Yi Fist Set, and a rather nice Sun style Xing Yi sword. Little talking but a lot about the Sun style for the interested student. VCD #389 Tian BaGua Tian BaGua Basics Click to see a video on Tian Bagua style. This first form, Basics, is nonetheless built on a circle and is an entire round of BaGua circling in itself. Teacher Tian has interesting and some may say even impressive timing with sudden wing flap motions that open his body considerably. A very expressive form of BaGua and worth a look. This introductory but not simple set contains the fundamental Single and Double Palms, the high stepping actions, the cross movement of the Twin Fish design, and other fundamentals to the style . Demonstrator: Tian Ke Yuan, said to be tenth generation inheritor. Tian style Yin Yang Bagua originated in the gnarling Cheng Mountain and Emei Mountain, Szechuan Province. The entire style is subdivided into 8 animal forms. Each animal form represents one of the Eight "Gua" or trigram from which BaGua theory and the Book of Changes is created. The Eight animals are said to be Boa, Lion, Tiger, Bear, Snake, Horse, Monkey, & Eagle. The style totals 192 Palm actions. 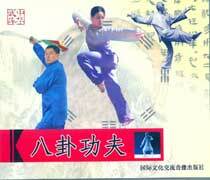 An unusual style due to its timing, pauses, fa jing motions and almost stuttering moves mixed with fluid actions. High stepping, heel off the ground, many movements not associated with classical BaGua. High stepping, heel off the ground, many movements not associated with classical BaGua. Teacher Tian has interesting and some may say even impressive timing with sudden wing flap motions that open his body considerably. A very expressive form of BaGua and worth a look. This particular VCD introduces another complete set in the style but of more complexity than that of the basic set. Once again an unusual mix of fluid actions and strangely stuttering and almost awkward motions (not necessary a bad sign, often more indicative of an indigenous authentic style). High emphasis on the Phoenix or Eagle position as the basic circling guard posture, faster more, smaller circles mixed with kicks and spins. This VCD shows another complete set in the style but of more complexity than that of the basic set. Once again an unusual mix of fluid actions and strangely stuttering and almost awkward motions (not necessary a bad sign, often more indicative of an indigenous authentic style). High emphasis on the Phoenix or Eagle position as the basic circling guard posture, faster more, smaller circles mixed with kicks and spins .